I have made a little XMB mod for the 3.55 XMB that I call XMB File Manager (XMBFM). 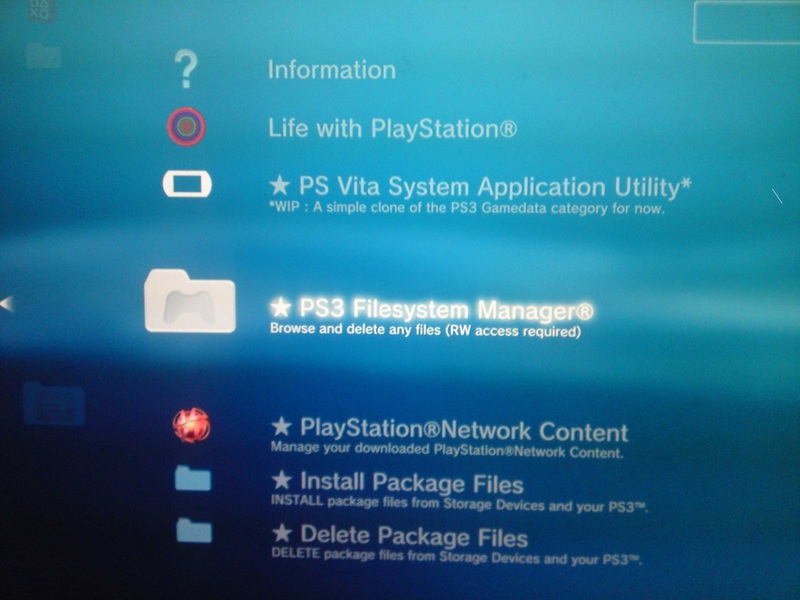 It is a modded version of Rebug’s package manager which in turn is a modded version of the official install packages option/XMB icon, My version allows the entire ps3 filesystem to be browsed and also any files types can be seen and deleted,also working on adding a lot more to the Manager and maybe building in the SaveData/Gamedata options to tidy up the XMB game category. Im hoping to add things like copy function etc too but would like to get feedback and help if anyones game? Im told this also works fine on most if not all 3.55 based FWs (even on 4.00OFW, probably works on every OFW ever made!) but I havnt tested it on anything except Rebug 3.55.2 CFW, Its been confirmed working on 3.55 kmeaw , OFW, Cobra etc, Worst case senario you would need to reinstall your FW through recovery menu if its not compatible with your FW. This is a beta version for anyone who might be interested in helping me test it or improve on it. Any Ideas/suggestions on more things to add to it, let me know. - Information A link to the release thread for now as a POC idea to have it link to an info page on the web. Manage your downloaded PlayStationÂNetwork Content. - I use multiman , go to settings near the bottom of menu. Have fun and let me know if you have an ideas on how I could expand it by adding things like copy function etc. Im not the best at this so any help is much appreciated? Big massive thanks to Cyberskunk and Evilsperm (Team Rebug) for the Package Manager mods which this is based on. And also for Rebug CFW.. its my favourite! Big thanks to PS3hen who has confirmed its still working on OFW4.00, He has built it into his impressive 4.00HFW(Flasher required for 4.00 install unless on 3.55 ). If anyone wants to explain an easy way of making this into a pkg file I would be delighted to hear or get some help, Im sure its not very difficult but I havnt time to figure out everything and would like this to become even more of a collaboration if anyones interested? - Finish off the built in updater and get a direct link set up for the pkg files like sonys. - Add a new category for favourite websites so they can have a direct link on the xmb inside the Filemanager. - move the PS3 gamedata and save data icons/options inside the file manager to tidy up the Game category. - Move Rebug Package Manager into its own sub category inside XMBFM so its like it was before. - This update will only show up in the retail menu. - Have now added a "Information" link above all the others inside the XMBFM, it opens the browser and links to the release thread! - but it wont install it yet, errors out at start of install , I need a direct pkg link to some signed homebrew to test, anyone? ?